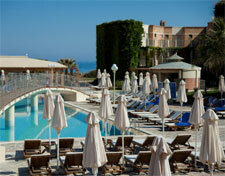 Aquis Bella Beach lies on a beautiful stretch of the Cretan sea in the centre of the northern coast of Crete. This extremely select hotel at which earthy hues are dominant has been built with local brick and marble and the overall tranquility leaves one with a lasting impression of the grandeur and comfort of bygone days. The relaxing pool area invites you to laze away your holidays, while there are, of course, many leisure and sporting activities available for those who prefer them. One thing is certain, that even before leaving Aquis Bella Beach, you will have made a promise to yourself to return. Aquis Bella Beach can accommodate up to 332 guests in its rooms and junior suites. The austere but luxurious ambiance, the tranquility and relaxing atmosphere in combination with the comforts and impeccable services, guarantee a wonderful and unforgettable stay. Aquis Bella Beach boasts beautifully proportioned gardens, ideal for strolls, open-air theatre, medical room, shops, wireless internet, car rental services, foreign exchange services and other services, which in combination with high quality services, impeccable organization of facilities, friendly service, hospitable environment, nostalgic atmosphere and a plethora of activities, guarantee to make your holiday an unforgettable experience.